When you get people together, even to work toward an overtly positive goal, things go haywire. The most organized people are often balanced by the haphazard. Tangents occur, off-topic discussions happen, and before you know it, the allotted meeting time us up, and the only thing that you’ve been able to decide on is whether or not you have a quorum so you can approve the minutes from the last meeting. And you probably don’t because getting schedules to align may just be the hardest part of nonprofit board management and committee service. There is, however, light at the end of the conference table. Wired Impact (the same folks who made this delightful volunteer management plugin) has done it again with their free nonprofit board management software called, very aptly, Nonprofit Board Management. The devs at Wired Impact understand what nonprofits deal with. For all the good work that comes from NPO boards, there’s a ton of behind-the-scenes logistics that need to be worked out. Documents have to be available to everyone (but still be secure and confidential), meetings have to be set, committees have to be appointed, members rotate and so do their positions. Juggling it all can be pretty tough. The same can be said of any committee really, not just nonprofit boards. Faculty committees are a major part of academic life (even stipulated in most contracts as a mandatory duty for many instructors and professors), and just because you have a group of PhDs working together absolutely does not mean anything is getting done efficiently. The same goes for any committee really — volunteer groups, subcommittees within those volunteers, mastermind groups, community event organizers, whatever. The idea is still the same. High-level background management is hard. But it doesn’t have to be. 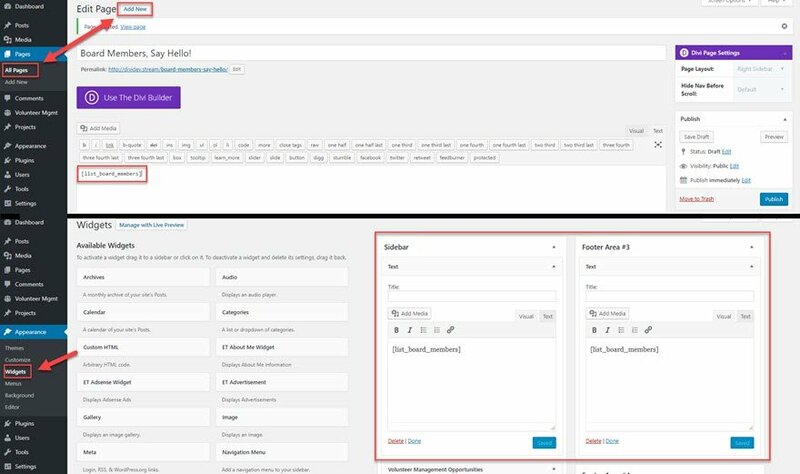 This plugin sets down a foundation you can use to keep your board or committee (faculty or otherwise) on track so that not only will the minutes be approved, but they’ll be full of useful information and actionable insight, too. 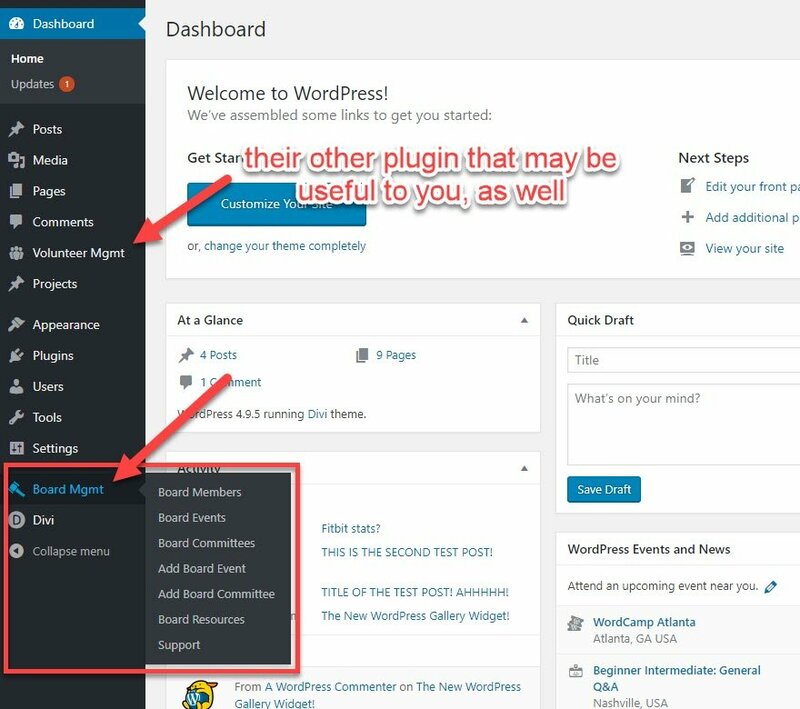 When you download and install the plugin, you get a new menu in your dashboard: Board Mgmt. You can find it near the bottom of your admin panel. You become a board member immediately. Now you can RSVP to meetings, be put on committees, whatever. Or you can do none of that. 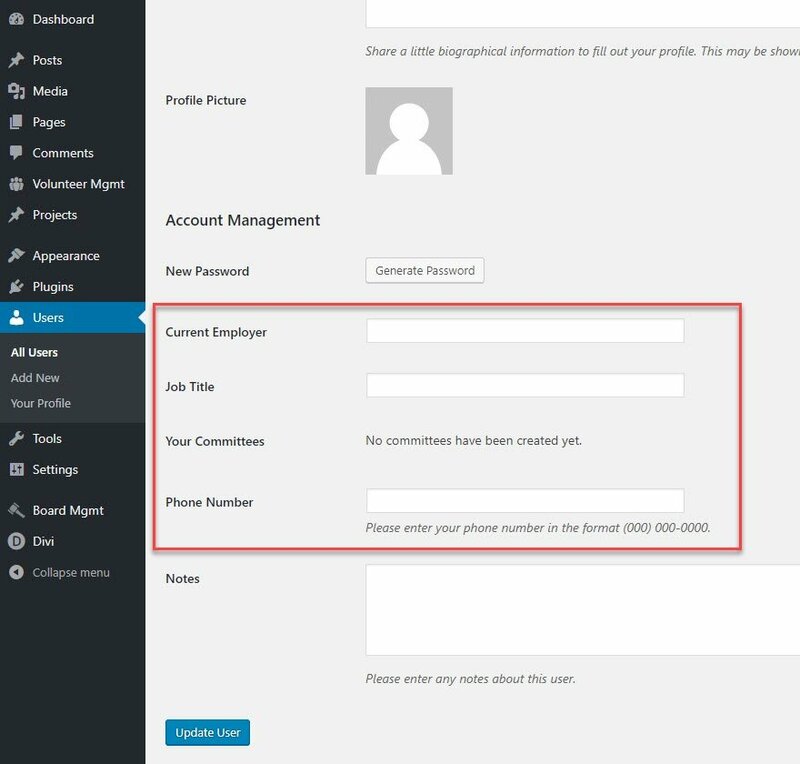 Basically, you just have access to the full range of board-member functions within the plugin. From this screen, go ahead and hit the Add New User button at the top. 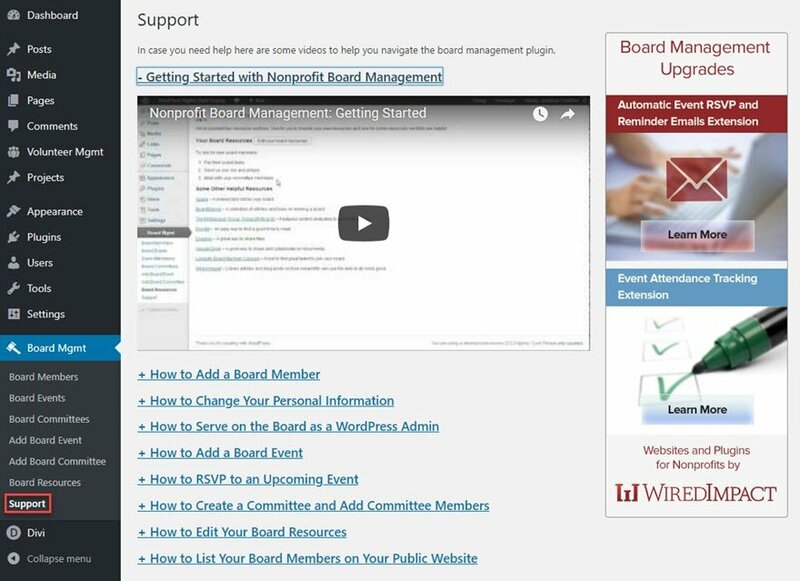 What’s cool about the Nonprofit Board Management plugin is that they use the default WordPress users as a base and add new fields and roles for you. Adding a new member is as easy as adding a new member. If you have an email for them, you’re good to go. Save the new member, and they will be listed in the overall WP user list, just like everyone else. Only they’ll be the Board Member role instead of Volunteer, Admin, or Keymaster. Editing any Board Member will take you to the same profile page as everyone else, but there are a few new fields: Current Employer, Job Title, Your Committees, and Phone Number. All things board and committee members will need to know about you and be able to easily look up. 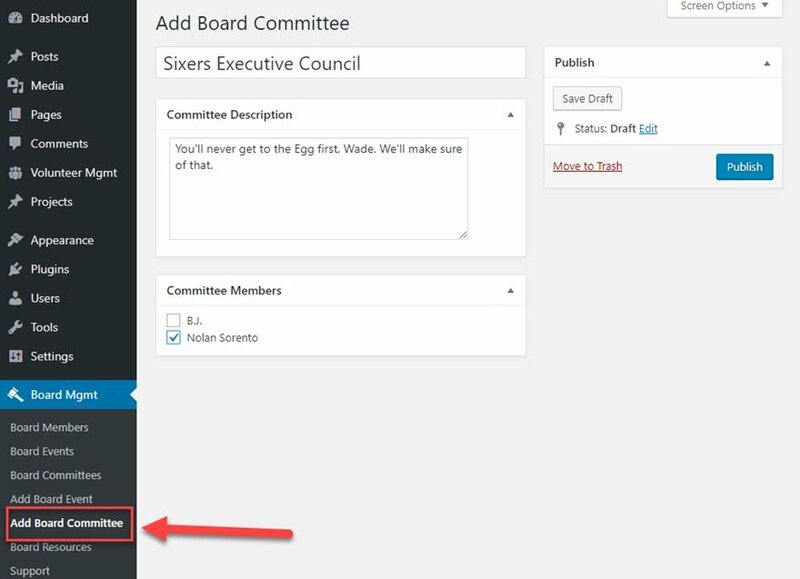 Also, the info here will show up later, too, if you want to list your board members on your site using a shortcode. Nonprofit board management doesn’t have to be all meetings and drudgery. Maybe you’re hosting a cookout or a luncheon or an envelope stuffing party. But most likely a meeting of some sort. Getting people to show up can be tough. You all probably also use different scheduling systems, too, and maybe your calendars hate each other (Outlook and iCal, I am looking at you). If so, then you need…Board Events. Under Board Mgmt, you have the Board Events page. You can hit the Add Board Event button to do just that, and you can also sort them by past, upcoming, or all events for the board or organization. You see the Location, Date and Time, Description, Attendees, and all the RSVPs. Actually creating the Board Event is no harder than writing a blog post or scheduling the meeting through Outlook or Google Calendar. You give it a name, a location, a date and time, and you can write a description so folks know what it’s about (you can go into as much or as little detail here as you want — full agenda or a short snippet). Then just hit Publish, and you’ve scheduled your meeting. Remember, there is an Add Board Event menu item, too, so you don’t have to go through the list view every time. 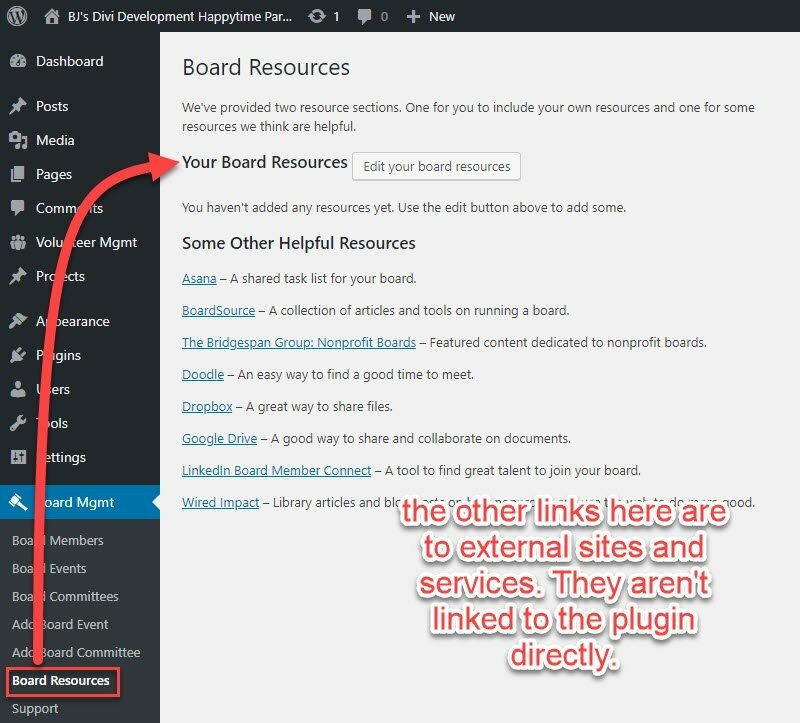 Since we’re talking about events, this is also the point at which I should tell you about the two premium extensions for the Nonprofit Board Management plugin. They’re not required by any means, but if you want to add a little automation or tracking into the mix, Wired Impact can do that, too. 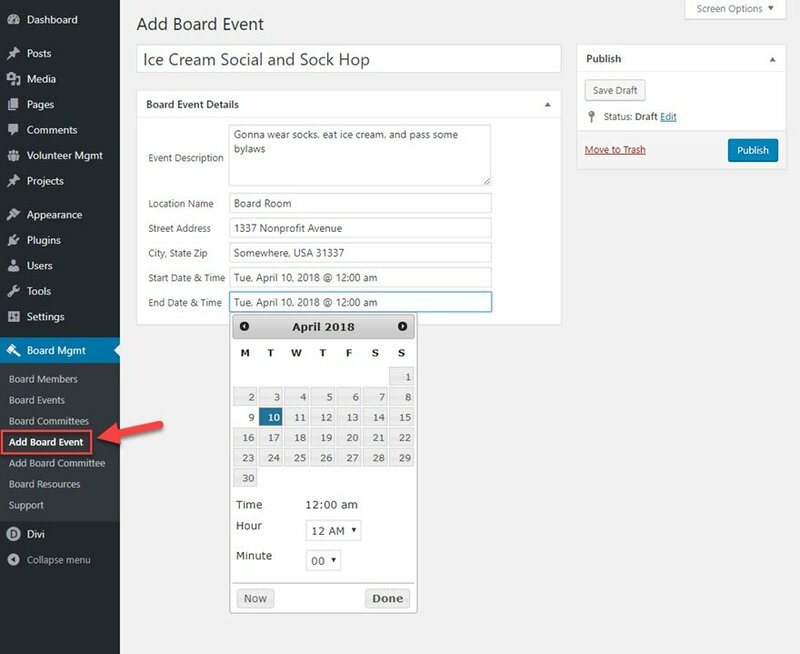 The Event Attendance Tracking Extension does what it sounds like: tracks attendance for your board meetings. You can go through and get an overview of the board, overview and breakdown of an individual member, and get summaries and reports. This is great for end-of-year reporting and grant analysis. It’s also $11 for a year, so it’s pretty reasonable. Also, you can get the Automatic Event RSVP and Reminder Emails Extension for$17. Again, it’s pretty simple to see what it does. They can RSVP from within their email client, see who hasn’t RSVPed yet, get automatic reminder emails sent out (this in itself is worth the $17, I think), as well as manual ones, who gets the reminders, and quite a bit more. For $28 total, you can get a ton of functionality added to Nonprofit Board Management, and I think it’s worth it. But they’re totally optional, too. Board Committees are almost exactly like Board Events. You have a Board Committee and an Add Board Committee button in your admin dashboard. Either will take you to a very simple page where you can enter a name, members, and description of what the committee is supposed to do. When you hit Publish, the committee is then attached to any of the board members you selected. The Board Committee page lists all of the members of all committees. And as your board grows and moves through its life, you will accrue more and more committees. So make sure to take advantage of the search feature for record keeping. 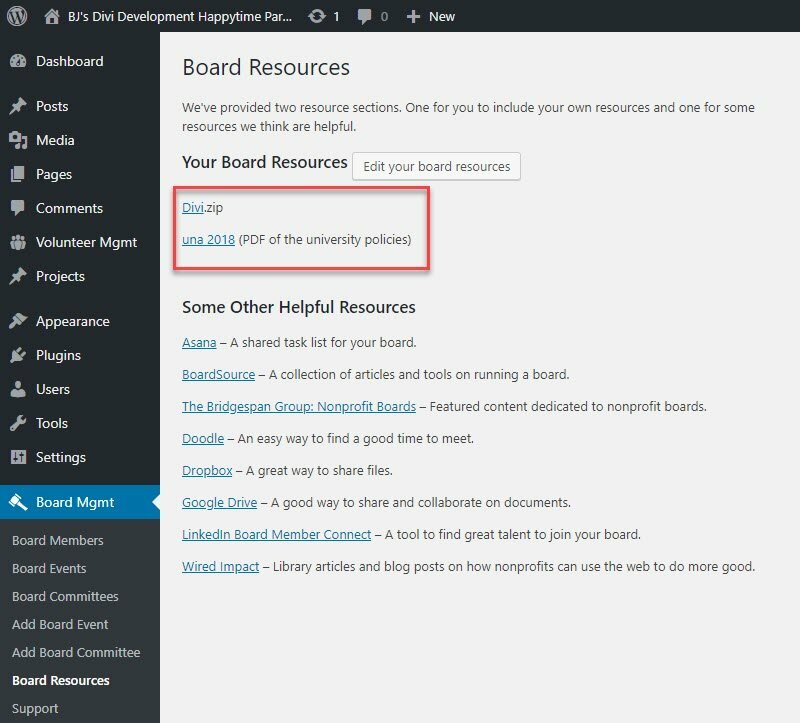 The final menu item you’ll need access to is the Board Resources tab. In a lot of ways, this is the most important part of the plugin because keeping people on the same page (sometimes literally) is every bit as important as making sure their schedules align. Taking advantage of Board Resources is imperative to that. Instead of having email chains with new versions of documents, trying to find which particular email contained which particular attachment a board member needs, this tab is meant to help organize all the stuff your board needs in a single, unified space. In many ways (most, actually), the Board Resources page works exactly like publishing a post or a page. Go ahead and hit the Edit your board resources button, and that will be apparent. You can add anything to Board Resources by clicking the Add Media button, and then uploading your files (or selecting it if it’s already in your media library). After that, click Update to see your resources show up exactly where they should be and formatted exactly like you want them. Voila! Now you’ve got a full backend for your nonprofit board management, faculty committee organization, or whatever else you need to keep people and info where you can get to it at any point. 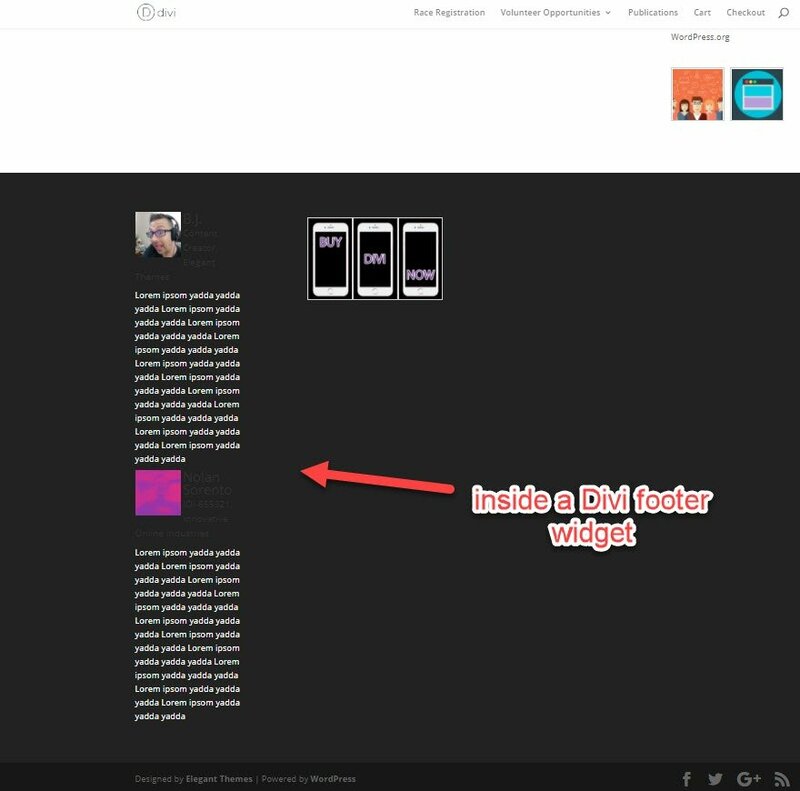 Just throw that shortcode into any spot that renders it (a post or page’s text editor, a Custom HTML or Text footer or sidebar widget, a Divi code module, wherever), and a full list of your board members will render on the front-end of your site. 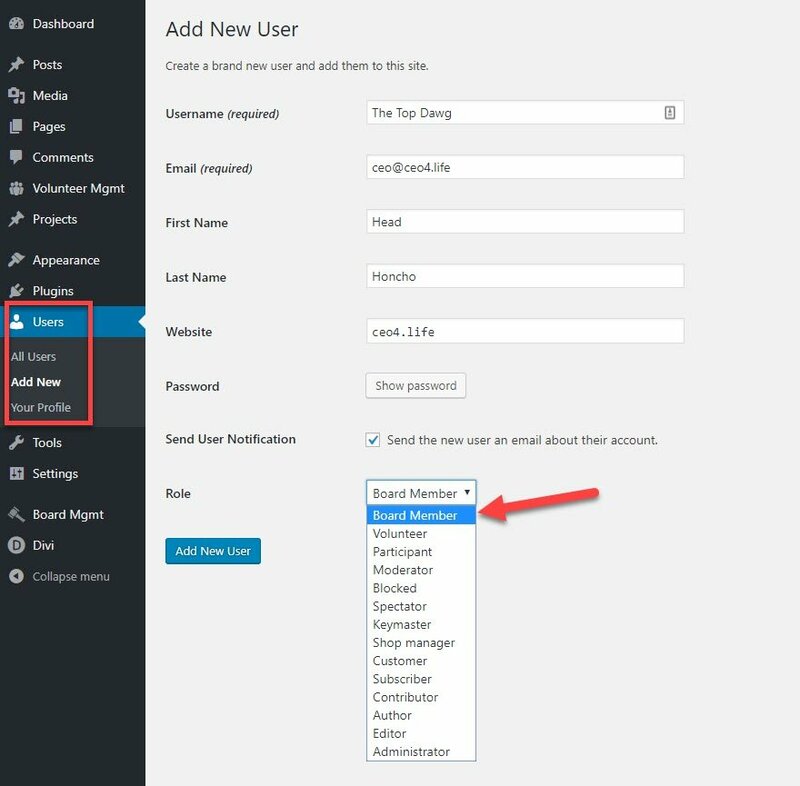 Whenever you publish the code, it will pull any of the information you’ve included in the User profile for each member. Given how most boards are pretty extensive, you’ll want to limit the bios to the post/page body. Including the shortcode in a widget is unwieldy, but I wanted you to know that it was possible. The Support area under Board Mgmg is worth mentioning, too. The Wired Impact website is full of resources for you, too, but this page has basically a FAQ to cover common issues. I really wanted to take a second to call it out because they’re not just text entries, but video walkthroughs. They’re really accessible and helpful — more so than many text FAQs and support pages tend to be. Ready for Some Easy Nonprofit Board Management Yet? How do you handle committee and nonprofit board management? Awesome…I’m excited to try this plugin. Will check these out for our not-for-profit. Is there any links to on-line storage such as google drive for resources, or only as on our case a shared hosting? Do you know of any other comparative plugins? Good question. Drive, DropBox, etc. are shown in the “Board Resources” section above, but I can’t tell if they are integrated. Could you let us know please B.J. ?